Consolidated revenues up by 7% sequentially and by 14% Year-on-Year (YoY). The growth is largely driven by strong performance from Indian Operations. Consolidated EBITDA at Rs. 3,550 crore. EBITDA margin improves by 120 bps sequentially. Profit after Tax at Rs. 232 crore. Higher by Rs 281 crore sequentially and by Rs. 2,980 crore YoY. Deliveries grew by 14% sequentially and 27% YoY, outperforming the domestic markets which grew by 3% sequentially and contracted by 2% YoY. Kalinganagar Steel plant crossed 1.5 million tonnes of Hot Metal and 1 million tonnes of Hot Rolled Coil production since commissioning in May 2016. Automotive sales grew by 20% YoY, while Industrial Products, Projects & Exports vertical witnessed 47% YoY growth. Branded products grew by 13% YoY, despite the impact of demonetisation. The performance of Ferro Alloys & Minerals division registered sharp improvement on the back of improved market conditions. Operating profit of the division at Rs. 302 crore is higher by Rs.141 crore sequentially and by Rs. 267 crore YoY. EBITDA improved to Rs. 3,393 crore, up 70% sequentially and 110% YoY on the back of supportive realisations, strong growth in deliveries and ramp-up of Kalinganagar plant. Jamshedpur plant continues to be the benchmark in India for Coke & Pulverized Coal Injection (PCI) usage and achieved lowest best-ever coke rate of 361 kg/tonne of hot metal and highest best-ever PCI rate of 179 kg/ tonne of hot metal in Q3. Liquid steel production of 2.68 million tonnes was about flat on sequential basis, but 4% lower than Q3 FY16. Deliveries of 2.37 million tonnes were 3% higher sequentially, but 13% lower YoY following the strategic decision to focus on higher-value added products in UK. Rs. 425 crore lower sequentially. Differentiated product sales continued to gather pace, with the proportion of total sales rising to over 35% and their value rising by almost 30% YoY. Revenue for South East Asia operations grew by 11% YoY to Rs. 1,985 crore, on the back of improved deliveries at Tata Steel Thailand and supportive realisations. EBITDA increased by 82% sequentially and 138% YoY on better spreads, reflecting improved market conditions at both NatSteel & Tata Steel Thailand. Gross debt remained stable at Rs. 84,752 crore as on December 31, 2016. Net debt was Rs.76,680 crore. Strong liquidity position with cash & cash equivalents, current investments including undrawn bank lines of ~Rs. 15,000 crore. 100% equity stake in Brahmani River Pellets Limited, a pellet and iron ore beneficiation plant connected through an underground slurry pipe line, which is a strategic fit especially for Kalinganagar steel plant. Majority stake in the port company for the proposed development of ‘Subarnarekha port’ in Odisha. Tata Steel UK (an indirect wholly owned subsidiary of Tata Steel Limited) reached an agreement with the trade unions to progress towards the closure of its defined benefit pension scheme to future accrual and take an important step towards a more sustainable future. Ballot on the scheme is currently open. Tata Steel UK signed a Letter of Intent with Liberty House Group to enter into exclusive negotiations for the potential sale of its Specialty Steels business for an enterprise value of £100 million. Tata Steel Minerals Canada together with its parent companies concluded Direct Shipping Ore Project de-risking transaction, securing equity & debt investments of CAD 175m from Government of Quebec. Achieved sales of 1.6 million tonnes. Mr T V Narendran, Managing Director, Tata Steel India and South East Asia, said: “Tata Steel recorded strong sales this quarter as the strength of our franchise helped us counter head-winds due to demonetisation. While the broader market was affected by lower rural sales and adverse consumer sentiments, we were able to increase overall volumes by 14% sequentially and register strong growth across all our target customer segments. Further, our focus on cost improvement initiatives and our integrated operations helped us to contain the impact of rising raw material prices. Our Kalinganagar facility continues to ramp up smoothly and we are well positioned to serve the increase in demand due to the expected thrust on infrastructure in FY’18. Our SEA operations delivered stronger operating performance this quarter due to a combination of better market conditions, cost rationalisation and higher exports." 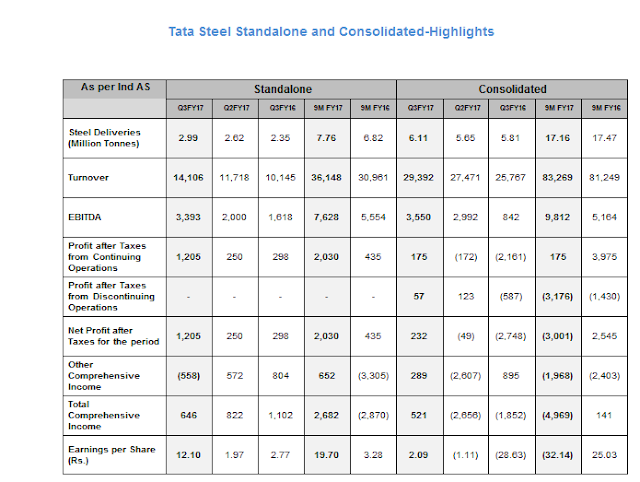 Mr. Koushik Chatterjee, Group Executive Director (Finance and Corporate), said: “The Tata Steel Group showed consistent improvement in the performance for the December quarter compared to the comparable period previous year with 900 basis points EBITDA margin at the consolidated level backed by about 800 basis point expansion by Indian operations and a turnaround of European EBITDA from negative 6% in the previous year to positive margin of 5% during this quarter. The financial performance reflects strong underlying operating performance across the group inspite of a seasonally slow quarter in Europe. While there were challenges on the working capital levels due to increased prices of both raw materials and finished goods especially in Europe, the company has been able to maintain its overall debt level at the end of the quarter. Mr Hans Fischer, MD & CEO of Tata Steel in Europe, said: “Our European strategy continues to be focused on developing differentiated products and services which improve our customers’ competitiveness. Sales of differentiated products were +13% higher and their value-add almost 30% higher than a year ago, with stronger sales in the automotive and construction sectors. “This helped us to achieve an EBITDA in the third quarter of Rs. 610 crore, though this was lower than the sequential quarter due to higher raw material and energy costs. Our third-quarter EBITDA result was significantly better than the loss recorded in the previous year partly due to better market conditions and the weakness of the pound relative to the Euro. “Among new product launches were a faster-to-install insulated building panel, a product used in lighting and ceiling components made from our innovative MagiZinc® coated steels, and an extension to a range of coated automotive steels which reduce costs for customers.